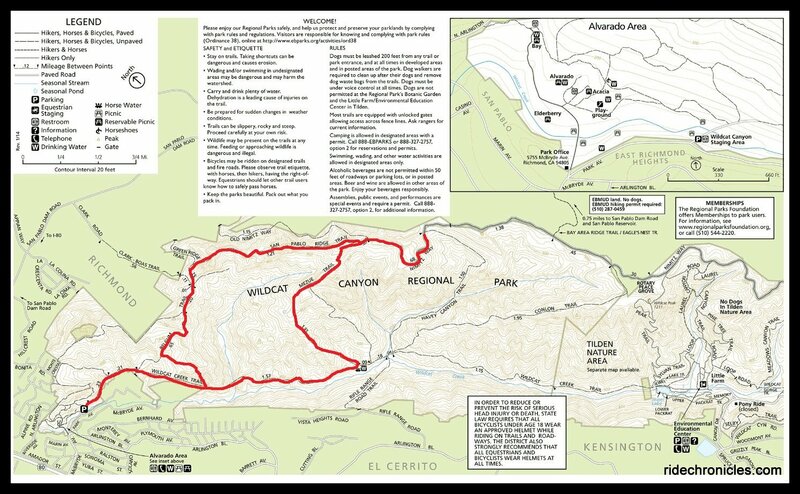 Begin this trail hike from the Alvarado Staging Area at Wildcat Canyon Regional Park on Park Ave in Richmond. The gentle rolling terrain travels south along Wildcat Creek on a wide paved road for the first 1.2 miles. The trail continues on a broad fire road through the oak/bay woodlands to Mezue Trail. At the trail junction; go left through the trail gate onto Mezue Trail, it climbs uphill through the open grassland with expansive views of the surrounding hills to the east and gorgeous bay views to the west. The trail continues NE as it climbs up towards San Pablo Ridge at 1000 feet. At the San Pablo Ridge/Old Nimitz Hwy junction; turn right onto Old Nimitz, it runs southward along the ridgeline to the scenic bench overlook near the Old Nike Missile Radar Site. Enjoy the views of San Pablo Reservoir and Sobrante Ridge! Retrace your steps along Old Nimitz Hwy back to the San Pablo Ridge junction. San Pablo Ridge travels along the top of the ridge with gorgeous panoramic views! Enjoy the spectacular SF/Bay views to the west! Enjoy the northeast views around West Contra Costa! San Pablo Ridge Trail continues along the expansive rolling ridge to Belgum Trail junction. Panoramic views along the ridge! Go straight onto Belgum Trail, it winds down around the hill to Monte Cresta juntion. Stay on Belgum Trail, it drops down towards the stands of eucalyptus, live oaks, bay laurels and grove of palm trees. At the Belgum Grande Vista Sanitarium information display panel, turn left and follow the unsigned trail to view the ruins of the sanitarium. In the hills above Richmond, hikers encounter a unnatural patch of vegetation. While oaks and other native trees dominate the landscape in the hills, here we find palm trees in a dense cluster. The living things are a clue to the history that’s buried at the site. Grande Vista Sanitarium foundation and fruit orchards. Make you way up the hill to the trail gate above Wildcat Creek. Drop down onto Wildcat Creek Trail and turn right, retrace steps back to the staging area parking lot. 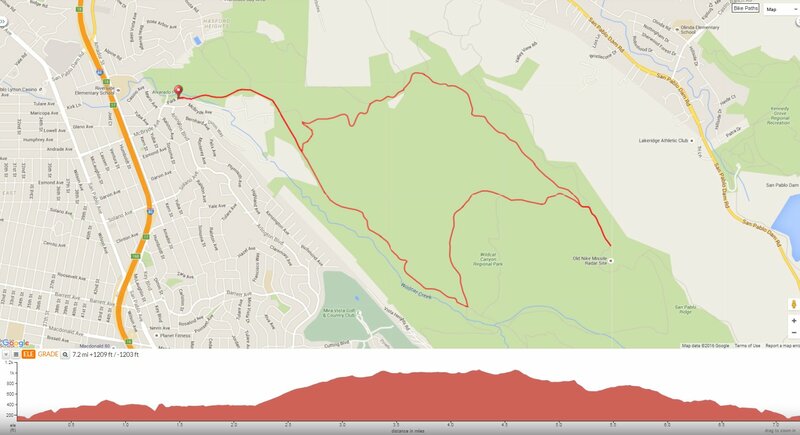 This is a fantastic local hike around Wildcat Canyon Regional Park. You’ll enjoy the phenomenal bay and valley panoramas along San Pablo Ridge and the beautiful expansive grasslands with stands of coast live oaks, eucalyptus, bay laurels and scatterings of chaparral-covered slopes! Parking: No fee at Wildcat Canyon Staging Area off Park Ave in Richmond. Pit toilets-Water Available at Alvarado Park. Water fountain at Mezue Trail junction on Wildcat Creek Trail. Weather: Low clouds, overcast, breezy and cool with some sun. Temps ranged from the low to high 60’s with brisk SW winds. Great sounding hike for a warm Concord day, thanks. For sure, you get a nice breeze from the bay….